“Well, what about my wife?” was the first thing that popped into my mind, wondering what the heck she was talking about. When I’m in “good husband mode,” I’ll often grab my dear wife a Diet Dr. Pepper. When I’m trying to either stay in good husband mode or get out of trouble, I’ll even drop a Diet Dr. Pepper by her work. Erika knows this, and because she typically waits on me, Erika wisely thought to ask and I have her to thank for getting to be the hero that morning as well. There are any number of reasons I can list why I go out of my way to patronize OnCue, but this kind of service is high on the list, and Erika deserves a special shout-out for setting that tone. Great lesson for any of us no matter what industry we are in: Know thy customer! 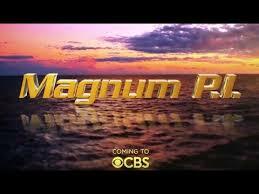 I’m gonna go all “grouchy old man” on you and predict early that the new Magnum, P.I. series could fail. For one thing, the original show was really good because it was, well, original! It was a cool action show yet the characters were believable and likeable, they grew and developed over the show’s 8 seasons, on and on goes the list of things we loved about that 1980s classic. This is a remake, a redo, a re-imagine, whatever. Because it’s not the original, there will be constant comparisons to the original which could really hold it back. Yeah, I know, there are shows like the rebooted Hawaii Five-O which are actually pretty good, I have to admit, but I really think this one is destined for a very short run, and for any number of reasons, but I’ll share just one for you to think about. In his autobiography, The Garner Files, James Garner told a story about how the initial imagining of the Thomas Magnum character was that of a near superhero who was flawless in his execution, never lost at love, etc. Tom Selleck, who had guest starred repeatedly on Garner’s hit show The Rockford Files, knew one of the reasons for Rockford’s success was that the Jim Rockford character was very fallible, wasn’t afraid to show fear, and so forth. So he suggested a rewrite of the Thomas Magnum character and one of the most iconic TV characters was born. The trailer for the new show suggests this new Thomas Magnum will be that superhero type who can leap from a speeding truck onto a helicopter and do all kinds of other impossible stunts. Fearlessly. How is that any different from any other modern, cookie-cutter TV or movie action hero? Plus, the previews suggest we’ll be bombarded with special effects since that technology is so cheap it’s affordable for even the smallest TV series budget. The effects and the splashy editing will likely be the real star of the show, completely counter to the character-driven storytelling that worked so well for the original Magnum, P.I. To be fair, I’ll give it a shot, but I don’t plan on getting my hopes up. You’ve probably heard the saying, “70% of success is showing up.” You may have heard different statistics associated with it and/or you may have heard the quote attributed to different people. Regardless of who originated it, like a lot of sayings that have been passed down through the ages, there’s a lot of truth in it. The majority of success in many things in life is indeed directly correlated with simply “showing up.” Simply taking actions that can move you toward your goal will help you get there. No great surprise. “Showing up” is certainly VERY important when it comes to being a successful networker, but the MOST importatant thing you do in networking may be following up. Yes, it’s essential that you stay in the habit of regularly networking, especially when you may not feel like it. But even more essential is that you make sure that as you meet new contacts, you follow up with them so you can keep yourself top of mind when it comes to ways you may be able to help them. Or for ways you may be able to help those they know so they can eagerly refer you to them. Show up, follow-up, repeat. Keep after it and you’ll be happy with the results you see.